Bulk SMS Malaysia | SMS Credit Reminder - lowest price & most reliable Bulk SMS marketing tool, 2 way sms Malaysia, works with Bulk SMS Singapore, online sms solution, web sms marketing. 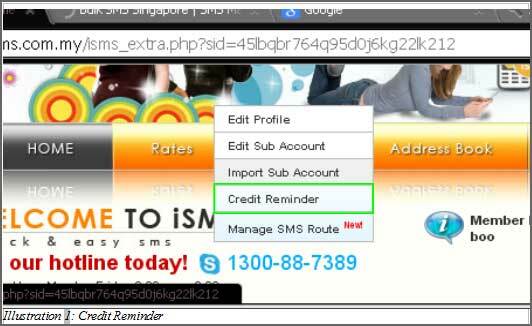 Bulk SMS Malaysia's credit reminder function is added to the bulk sms system to create convenience for you. With the credit reminder, you do not have to constantly log in to monitor your credit balance. Go to "Profile" from the menu bar, it will show out a list and choose "Credit Reminder" to remind user that their credit is going to end. Next, will go to next windows as shown below. As you can see, below is the reminder methods options. 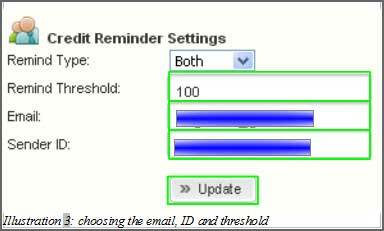 You can select either methods to send the reminder such as using email, sms or send to both. You have to key in the number in "Remind Threshold". If you key in 50, this means the bulk sms system will alert you when you credit balance reaches 50 credits. Fill in the remaining details such as "Email" and "Sender ID". Then, click on the "Update" button to submit the credit reminder. 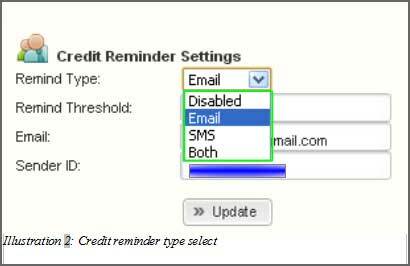 As the credit balance reaches the reminder threshold limit, the system will be triggered to send email or sms.